Chevelle Malibu Super-Sport Coupe - Full color 9 1/2" x 13" ad that shows a Light Green Chevelle that is being driven toward the reader and it is identified as having "New Style, New Size, New Spirit, New Name - A New Line of Cars". The text reveals that the reason that it look different and feels different is because "It is totally different from any car we've ever built before". It talks about the amazing room, more than you would expect, and the various engines available plus the eleven different models you could choose from. Each of them is backed by Chevrolet Dependability. Chevelle Malibu Super Sport Coupe - Full color 10" x 13" ad for the fact that this car is the Full Package. There is a picture of an evening on the road where a White Malibu Super Sport Coupe is being driven away from the camera while the General Motors company assures the public in the headline that "We didn't just make Chevelle beautiful and hope for the best". 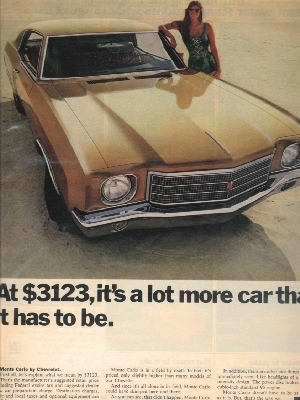 The text starts off talking about the style and tells us that this car is "smaller than Chevrolet and bigger than Chevy II". It talks about this size still giving room for passengers and suitcases and mentions a "wide choice of Six and V8 engines" as well as other options. Chevelle Malibu SS Convertible - Full color 9 1/4" x 12" ad has a overhead photo of a Green Convertible with the top down being driven by a couple along an asphalt road with dirt shoulders. The ad headline asks the simple question "Ever see a Chevelle that wasn't enjoying itself?". This ad contains a discussion of the models available and many of the options and standard features. This ad is larger than my scanner bed so the outer edges of the ad will not be visible in the scanned view. Chevelle Malibu SS Coupe - Full color 20" x 13" Two-Page ad for the improved models offered by Chevrolet this model year. The ad headline says "Let Chevrolet put you in beautiful shape for '65". Beside the Chevelle this ad has pictures and descriptions of the Chevrolet Impala SS Coupe, Corvair Corsa Sport Coupe and the Chevy II Nova SS Coupe. Each page of this ad is larger than my scanner bed so the outer edges of the ad will not be visible in the scanned view. Chevelle Malibu Super Sport Coupe - Full color 9 1/2" x 13" ad with a picture of a Burgandy Malibu Super Sport Coupe being driven right at the camera. Coming down a single lane road about the size of a sidewalk this car is being driven by a man with a broad smile on his face while his female passenger seems to be enjoying it just as much. 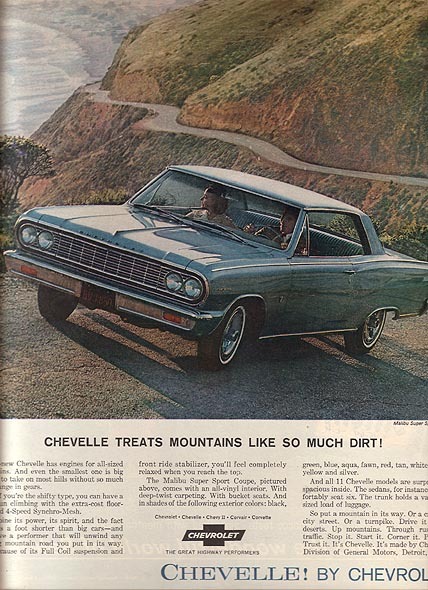 The ad headline warns you that "If it moved any better, you'd miss a lot of the scenery Chevelle by Chevrolet". 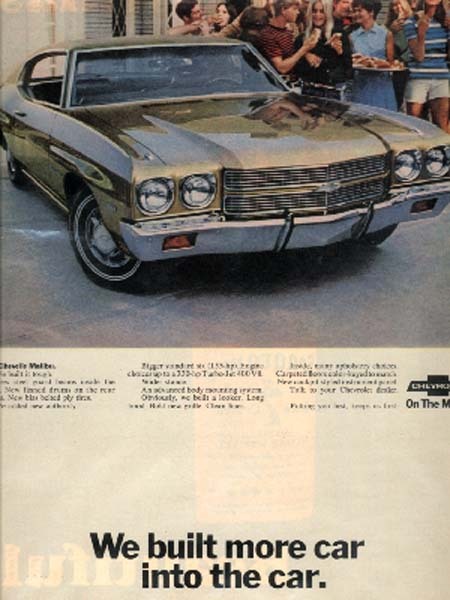 The information continues with the claim that "Move is what Chevelle does best - particularly with the wide range of performance equipment you can order for it". Now that your attention has been gathered it talks about the "around-town behavior" and the thrill when you get out of town. It mentions the quietness you will experience when you drive a Chevelle which is unusual in a medium-sized car. Chevelle Malibu Super Sport - Full color 10" x 13" ad shows a blue two-door parked next to a stream while the three people that seem to belong to this car are either playing in the water or watching those who do play. The ad headline states that "If you want to know how well it rides, wander off the Interstate a ways. Chevelle by Chevrolet.". The text urges you to "Spend some time. See some horses, cows and countryside. Sample what our Full Coil suspension does for comfort." It continues talking about comfort by mentioning the double-action shock absorbers and the front stabilizer bar before getting inside the care and talking about the seats. There is enough room left in the ad to talk about the transmissions and the ashtrays before ending up with a non-specific list of engines available. Chevrolet Chevelle Convertible - Full color 9 1/4" x 12" ad has a photo of a Yellow Convertible with the top down being driven by two couples who seem to be intent on seeing if the one girl's hat will fly out the back. 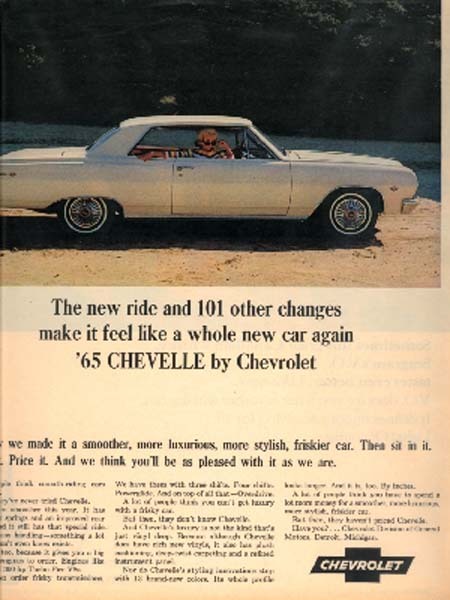 The ad headline claims that "Chevelle by Chevrolet has a few surprises for you". This ad is larger than my scanner bed so the outer edges of the ad will not be visible in the scanned view. Chevelle Station Wagon - Full color 6 1/2" x 9 3/4" ad has a photo of a Blue station wagon parked at the base of a sand dune as the occupants have unloaded their load of beach items and are working their way to the top of the dune. The ad headline describes it as "Big V8 up front, 86 cu. ft. of cargo space in back - and the time of your life in between. '65 Chevelle by Chevrolet". 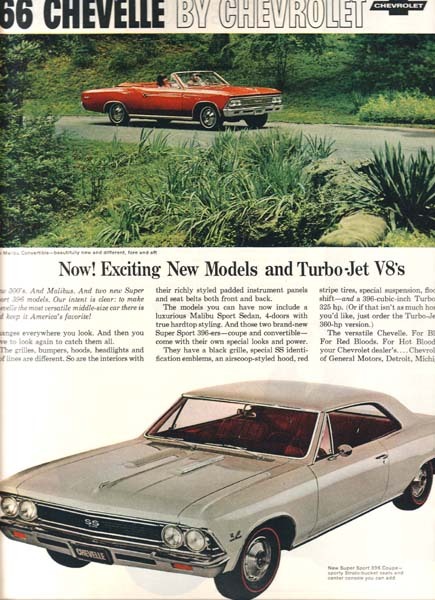 Chevelle Malibu Convertible and Super Sport 396 Coupe - Full color 9 1/2" x 12 1/2" ad with a picture at the top of a Red Convertible with the top down driving along a country road and, at the bottom of the ad, is a picture of a Light-Colored Two-Door with Red Interior. This one is the Super Sport 396 Coupe - sporty Strato-bucket seats and center console you can add. The ad headline proclaims "Now! Exciting New Models and Turbo-Jet V-8's" and then says "New 300's. And Malibus. And two new Super Sport 396 models. Our intent is clear: to make Chevelle the most versatile middle-size car there is and keep it America's favorite". The ad mentions many more of the features that were offered and was, probably, enough to start the blood boiling for many young men. Chevelles - Full color 9 1/2" x 12" ad that calls attention to the fact that "'66 Chevelles come as sporty as you care to go". 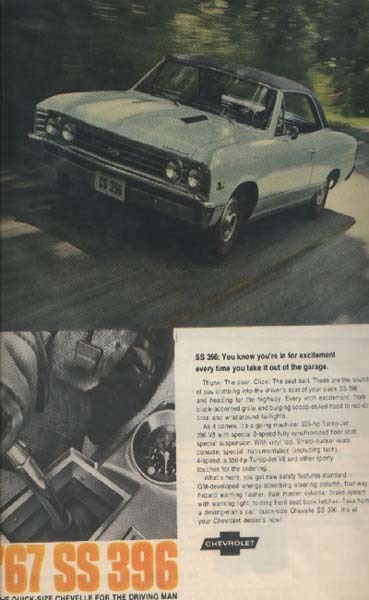 At the top of the ad is a photo of a Light-colored SS-396 coming at the camera on a tree-covered road while the caption mentions it being available as a Sport Coupe or a Convertible. It then talks about tyhe two different 396 cu. in. engines you could choose from and other options that would finish out your dream car. Below this a photo of a Blue Malibu Sport Coupe sitting on a white background. The caption here mentions a total of 12 models available and general options, all designed to allow you to drive in comfort. Chevelle SS 396 Sport Coupe - Full color 10" x 12 1/2" ad shows a drawing of a white Chevelle with the SS prominent on the grill and a very happy couple driving it. The ad headline describes it as "Chevelle SS 396. And the SS doesn't stand for 'Standing Still'". The text talks about the different horsepower packages available and the suspensions, tires and transmission and it mentions the special bulges on the hood. Chevelle SS 396 Sport Coupe - Full color 10" x 13" ad shows this Off-White Chevelle with a black roof on a country road with the background trees nothing but a blur. Beneath a smaller picture that shows the shifter with the clock in front of it it says "'67 SS 396 - The quick-size Chevelle for the Driving Man". The text starts off by saying "SS 396: You know you're in for excitement every time you take it out of the garage:. It then goes into the sounds that you hear when you sit down into the driver's seat: the Thunk of the door closing and the Click of the seat belt. Chevelle Malibu Sport Sedan - Full color 10" x 13" ad shows a Gold four-door Chevelle filled with at least five people and splashing along the beach. The headline calls it "The Quick-Size '67 Chevelle" and claims that it "Manuevers like Magic" The text talks about the changes this car offers such as new fabrics, color and trim and it talks about how agile and nimble it is. It mentions several other models going ffom the Station Wagon to the SS 396 and urges you to "Try one on for size." Chevelle SS-396 - Full color Two-page 16" x 11" ad for one of the popular Muscle Cars of the '60s. The ad has a large picture of a Red Chevelle against a blue background with the caption "It's vigor remains undiluted by it's comforts. (Another reason Chevelle's the most popular car in it's field". There are smaller pictures of the front end, a wheel, the 4-speed shifter, the bucket seats, the Four-Season Air-Conditioner, the Stereo and the usual view of the back end as it pulls away from the viewer. This ad is a smaller version of another ad on this page. Chevrolet Chevelle SS 396 - Full color two-page 19 3/4" wide x 13 1/2" ad with a photo of a Red Two-Door against a blue background. There are seven other chose-up photos of specific items of interest and the headline claims that "It's vigor remains undiluted by its comforts. (Another reason Chevelle's the most popular car in its field)". Each page of this ad is larger than my scanner bed so the outer edges of the ad will not be visible in the scanned view. Chevelle SS 396 Sport Coupe - Full color 9 1/2" x 12 1/2" ad with a photo of a blue Chevelle driving on a curvy mountain road. The ad headline claims that "There's a fine line between pure sport and pure luxury. It's called Chevelle." This ad is larger than my scanner bed so the outer edges of the ad will not be visible in the scanned view. Chevelle SS-396 - Full color 19" x 12 1/2" Two-Page ad for this powerful and racy new car. The ad has a picture of an Orange Car with Black Trim parked on a roadway with an orange light illuminating the way in front of it. The ad headline promises that "In ten seconds, your resistance will self-destruct.". Each page of this ad is larger than my scanner bed so the entire ad will not be visible in the scanned view. Chevrolet Chevelles - Full color 19" x 12 1/2" Two-Page ad for the complete line of Chevrolet Chevelles that were offered in 1970. Lined up on a large dried lake bed are a Dark Blue Malibu 4-Door Sedan, a Light Blue Malibu Sport Sedan, a Gold Malibu Convertible with the top down, a Light Gold Malibu Sport Coupe and an SS 454 Sport Coupe. The ad gives a list of items that are standard on each and every one of these cars, items that are not standard on other mid-size cars. Each of the pages in this ad are larger than my scanner bed so the complete ad will not be visible in the scanned view. Chevrolet Monte Carlo - Full color 9 1/2" x 12" ad has a photo of a Brown Monte Carlo parked on a dirt field with a couple standing behind the car. The ad headline claims "'71 Monte Carlo. Changed? No, refined." and the ad mentions changes, oops sorry, refinements like a different grill, they have widened the distance between the Power-Beam headlights, they have added a raised hood ornament and they have wrapped the control knobs in soft black vinyl. This ad is larger than my scanner bed so the outer edges of the ad will not be visible in the scanned view. Chevelle - Full color 9 1/2" x 12" ad has a photo of a Yellow Two-Door parked on a large grassy field. Behind this car stand a couple who are watching their two children sitting on the grass under an umbrella while another man stands farther back playing a guitar. The ad headline asks "'71 Chevelle. How do you change America's most popular mid-size car?" and answers it's own question by saying "Very carefully". This ad is larger than my scanner bed so the outer edges of the ad will not be visible in the scanned view. Monte Carlo - Full color 9 1/2" x 12" ad for the Inexpensive Luxury car from Chevrolet. There is a picture of a couple standing behind a Brown Monte Carlo that is parked on a rise overlooking a large subdivision as the sun seems to be setting. The headline says "Chevrolet Monte Carlo. Remind you of some exotic luxury car? Let us remind you of the price. $3,300." and the text begins to list the features that you will find on this car. Most on the list are impressive but the Electric Clock seems to pale in comparison. Chevrolet Chevelle - Full color 9 1/2" x 12" ad that is intended to show how protected you are when you buy one of these cars. The ad has a photo of a Green Two-door with different numbers attached to different parts of the body. The ad headline explains that 19, 20, 23, 27 & 60 fight rust." This ad is larger than my scanner bed so the outer edges of the ad will not be visible in the scanned view. Chevelles - Full color 20" x 13" Two-Page ad for the mid-size car that fits everything. The ad has a photo of a small area to park overlooking the High Sierra Mountains. Parked in this area are a Red Malibu Sport Coupe that is visible from the front and a Dark Colored 4-Door Sedan visible from the back. The ad headline identifies these as "Chevelle for 1972. It fits more families, more budgets, more garages and more vacations". Each of these pages are larger than my scanner bed so the outer edges of the ad will not be visible in the scanned view. Monte Carlo S - Full color 7 3/4" x 11" ad has an overhead photo of a maroon Monte Carlo driving along a roadway that goes along the edge of some water. The ad headline asks you to "Make your own comparison between Monte Carlo S and the Great Road Cars of Europe". Chevrolet Malibu - Full color 10" x 10" 19 page Dealer Brochure. Included in this item are color schemes, options and many pictures. This item is larger than my scanner bed so the outer edges of the brochure will not be visible in the scanned view. Monte Carlo - Full color 9 3/4" x 10" 15 page brochure for this car. Among the items shown in this brochure are color schemes, options and specifications. This item is larger than my scanner bed so the outer edges will not be visible in the scanned view. Chevrolet Monte Carlo - Full color 11" x 11 1/2" 12 page brochure for this vehicle. This item gives many photos of the interior and exterior of this car, colors available for paint and material and different specifications. This brochure is larger than my scanner bed so the outer edges of the brochure will not be visible in the scanned view.